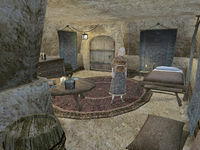 The St. Olms Canal North-Three is the residence of Hroa accessed from outside and located on the Canalworks level in the northern part of the St. Olms canton in Vivec. There are various containers, such as sacks, barrels and crates, containing random ingredients or cheap food. 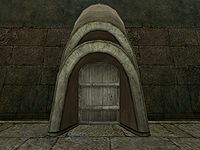 The only exception to this is the topmost crate in the southeastern alcove, which contains up to 10 gold (60% chance each) and also has a 25% chance of storing an restore attribute potion, as well as a small chance of containing random special and marksman loot. In the northeastern corner is a single bed owned by Hroa, beside which, on a stool, lie a total of 22 gold coins.